Human skeletons can be strange, even in the most normal of positions. Ancient bones have a particular knack for dropping jaws and not just their own. Societies who lived long ago sometimes buried their dead in strange ways for reasons that defy even what the experts know of their culture. But enigmatic skeletons are not the only ones found at odd angles. Victims of feuds, murder, and failed rebellions make a tragic return, while double graves reveal people with unexpected gestures and placements. The bubonic plague that swept through London was something out of a nightmare. The 1348 wave slaughtered more than half of the population. Nearly 50,000 victims received hasty burials in Smithfield. One grave held two men holding hands; their heads turned to look to the right. Another skull was also found with the pair. The men were aged in their 40s and arranged in identical positions, with one man’s left hand holding the right of his companion. 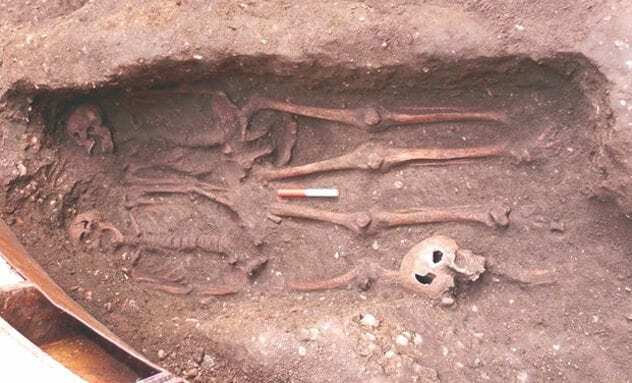 They died sometime in the early 15th century, meaning they were born after the horrors of 1348, but since they were interred in a plague field, it appears they did not survive the later waves that continued to cull London’s citizens. While the grave had been dug with care, no remnants of coffins or burial cloth were found. If they were placed directly in the ground, it is possible that the hand holding might be accidental. Who they were, why they faced the same way or how the older man received a defensive arm fracture remains a mystery. The extra skull appears to be from an older grave disturbed by gravediggers. The Corded Ware culture was a Stone Age people who buried their dead according to gender. When men died, the grave was filled with weapons and tools, and the body was placed facing west. Women went into the afterlife with domestic ware while looking into the opposite direction. In 2011, researchers found a Corded Ware man outside of Prague. When he died about 5,000 years ago, his community arranged the grave, and him, as a woman. Resting on his left side, the caveman faced east, and household jugs and pots kept him company. Considering that his people, who lived from 2,800-2,500 B.C., were very strict about funeral rites, this is unlikely to be a blunder on their part. 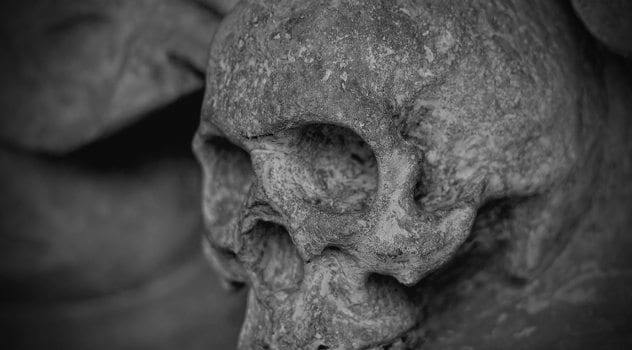 The archaeologists who discovered the strange skeleton believe it could signify the earliest discovery in the Czech Republic of somebody with a different sexual orientation and that it was accepted by the community. Skeptic scholars say that identification of a skeleton’s gender (by looking at pelvic differences) is about 90 percent accurate but not infallible. Over the course of 20 years, archaeologists studied 170 bodies in the Sonoran Desert. They were all laid to rest between 2100 B.C. and A.D. 50. Throughout the ages, burial customs in the Sonoran changed little. The dead were respectfully placed on their side in a curled-up position. The final resting place was then decorated with shells, crystals, bone tools, and pipes of stone. Eight of the graves, found near the Mexican-US border, did not fit any known tradition. The skeletons were in awkward poses, almost looking disrespectfully discarded. Some died violently. There were broken bones, and one woman’s head had been set alight. A younger man was found with four apparent arrowheads inside him. There were no ritual or preventative measures such as heavy stones or dismemberment that might have explained the corpses as victims of witch hunts or sacrifices. The way that the brutal treatment continued after death indicated the funeral was not a happy one. Researchers believe the desecration was reserved for victims of blood feuds. Recently, an ancient cemetery called Beshtasheni turned up two headless corpses and a head without a body. The graveyard consisted of 16 graves left behind by Late Bronze Age and early Iron Age tribes in southeastern Georgia. A young couple occupied a double tomb. The man was aged between 19-25, and the woman was around 23-25 years old. Their headless skeletons were in the fetal position. Resting on her right side, similar to her partner, the probable cause of the woman’s death came in the painful form of two bronze arrowheads. One had struck her in the leg and the other lodged close to the heart. Their heads were never found, but another showed up in its own grave. The girl it once belonged to was around 17-25 when she died. Her skull was displayed on a plate and surrounded by offerings of ceramics, beads, and metal objects. Nearly all the tombs contained such a wealth of artifacts that it surprised even the experts. It remains unclear whether the missing body parts were intentionally removed before burial, or somehow not available due to some misfortune. When developers began digging outside of Athens, the idea was to start clearing the land for new cultural centers. Instead, some human bones rose to the surface. After all were dusted and cleared, a tragic sight met the living. Eighty men, nearly half of them shackled, were sitting in neat rows. The majority were healthy, young individuals in the prime of their lives. Two vases unearthed from the mass grave allowed researchers to date the site to 650-625 B.C. The date range placed the group in a volatile era for Athens. One notable event occurred in 632 B.C. An Olympic champion called Cylon dreamed of taking over the city. To accomplish this, he raised an army, but when the people of Athens failed to join his rebellion, Cylon and his men were trapped inside a temple and massacred. There is no better evidence that these were Cylon’s followers, other than the time bracket being right and the shackles. The creepy, unearthly collection of skeletons is rare, though. Not many remains from the lower social classes have ever been found, and these make for a rich haul to study. Excavations in Scotland delivered an unexpected skeleton in a cave. The man was on his back and cross-legged. Beach stones weighed down his limbs. Found in the Black Isle, Ross-shire, the presence of human remains was surprising. They also found fireplaces and rubble from iron-working dating back to the time when he died. Finding a burial inside what was probably a smithing workshop is a mystery to archaeologists. When forensic anthropologists took over, they made a grisly discovery. 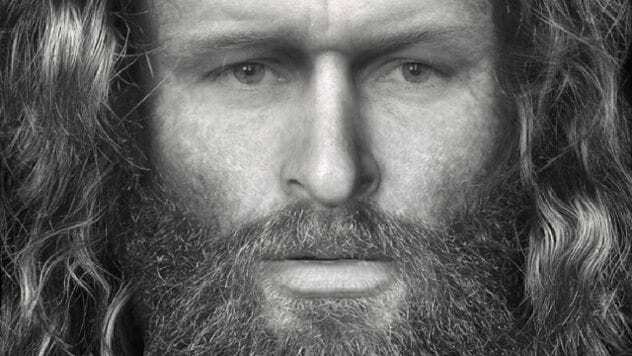 The 1,400-year-old man was murdered sometime between A.D. 430-630, also known as Scotland’s Pictish era. The attack he suffered was methodical and vicious. An object with a circular cross section was smashed into the right side of his face, shattering the teeth. A second swing, bearing traces of the same weapon, broke his jaw from the left. As he toppled down, a brutal blow was delivered to the back of his head. Once on the ground, a final thrust pierced his skull from one side to the other. It is unknown why he was killed, but he was buried with care, inside a dark alcove. A recent reconstruction of his face showed that he was young and handsome. The Etruscan civilization remains one of the most fascinating cultures. Peaking around 900 B.C., they were advanced and artistic. From them, the French learned about wine making and the Romans how to built roads. Their grave goods and art revealed an eclectic, good-natured people who respected their women. One skeleton brings a little-known aspect about the Etruscans to the fore—that they also had a cruel side. 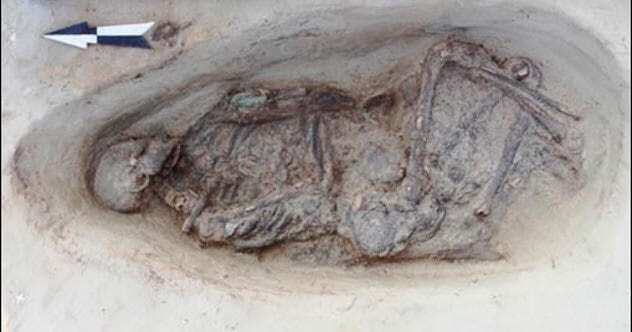 In Tuscany, archaeologists found an Etruscan burial with a 20-30-year-old man inside. He was still in the chains he had died in 2,500 years ago, leaving one arm awkwardly twisted. Iron around his neck and ankles weighed almost five pounds. The shackles were a complex system designed to prevent normal walking. The metal collar was once attached to a wooden object (now gone) that ran behind the neck. Also long since degraded, were leather or material cords that connected the punishing device from his neck to the feet. 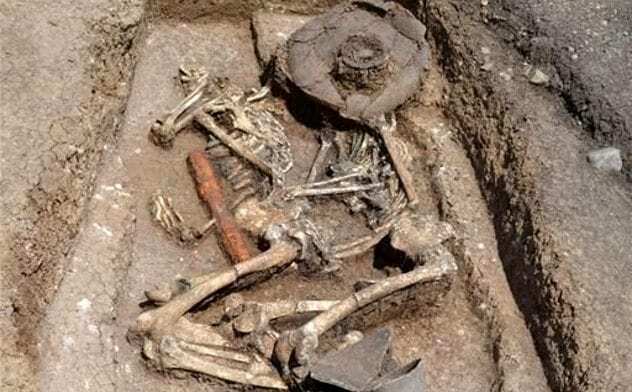 This first-ever Etruscan grave with a shackled person was unexpectedly found in a necropolis containing normal burials. 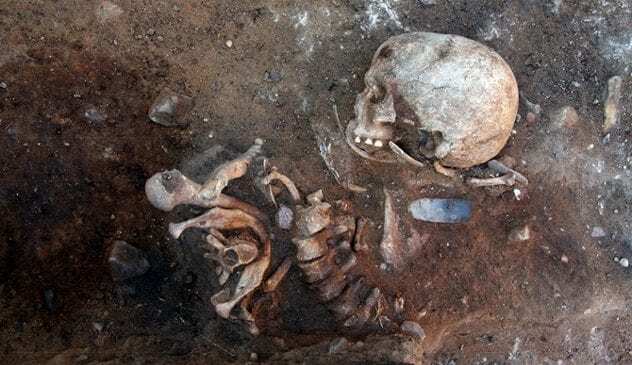 When scientists opened medieval graves in the Yamal peninsula, they found something odd. The archaeological site Yur-Yakha III is an 11th-century cemetery where four graves defied the norm. Unique for the time, the skeletons were crouching in a fetal-like fold. There are no similar graves on the peninsula. Other sites produced bodies in extended positions, which was normal for Yamal’s medieval period. Between the man and three women existed an abnormal amount of serious physical ailments. Just some of the conditions included shoulder dislocation, dental abnormalities, sinusitis, and lower spinal trauma caused by giving birth. The women were young, in their late teens or early twenties and the man around 50. His state was particularly diseased—and scorched. He had hyperostosis, a condition where bone tissue cannot stop growing, and as a child, he experienced more illness and starvation. After death, his body had been briefly set on fire. Enough to burn soft tissue but not the bones. There is no record of such a ritual or sacrifice from the region, which deepens the puzzle even more. Along Peru’s north coast, ancient prisoners-of-war could look forward to one fate. During gory ceremonies, such men were sacrificed. 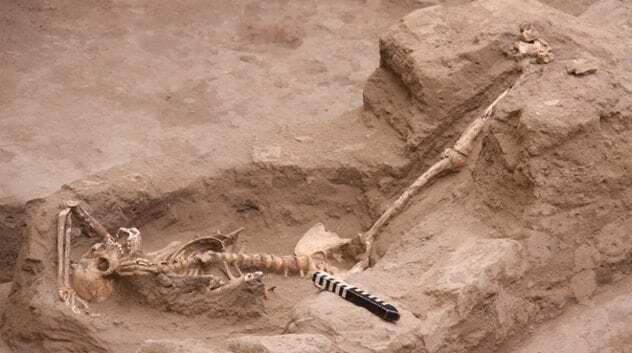 Recently, researchers encountered a different version when they found six skeletons near the city of Chiclayo. Found at a temple in Pucalá, they had clearly been sacrificed. Surprisingly, the remains belonged to healthy young women. 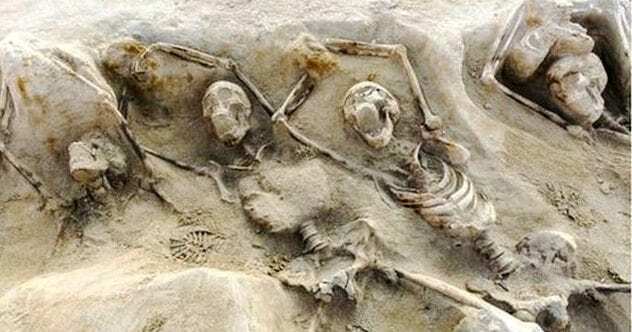 They were killed around A.D. 850, and their bodies arranged in odd positions. Four were piled into one grave. The other two were on sloping platforms, feet in the air. Also breaking with tradition is that it appears to have been a private event held within the temple. Sacrifice was often public, but the women apparently died behind high walls obscuring the ritual. They were buried beneath the floor of the mud-brick complex, but unlike other north-south Moche burials, they were aligned in an east-west line. The only thing they had in common with their male counterparts was that the bodies lacked several ribs. This fits with a known purification ritual of sacrificed individuals being left outside so vultures could consume their organs. During the Mesolithic, hunter-gatherers never remained in one location for long. 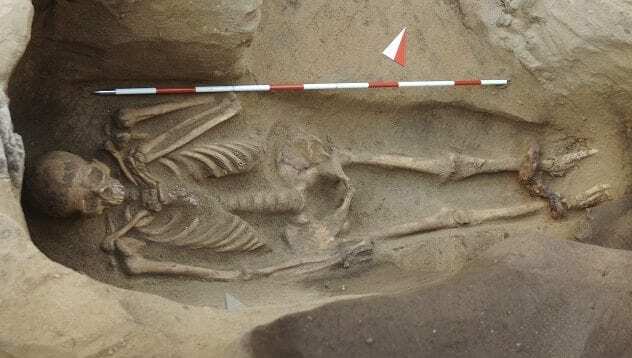 When nine skeletons were found just 50 miles north of Berlin, archaeologists excitedly realized they were looking at one of the earliest permanent cemeteries in Europe. It was used between 6400-500 B.C., and the oddest resident was a man who had been buried upright. Not only does he stand in a vertical grave but he was only partially covered up. After the young man died, about 7,000 years ago, he was placed in a standing position with his back against the wall of the five-foot pit. To steady the body, the hole was filled with sand to above knee level. The most bizarre behavior was that his community left him there, half exposed, until the upper body disintegrated from decay, and predators had a good nibble on his arms. Only then was the tomb completed. The strange sight was filled up and sealed by lighting a fire on top. 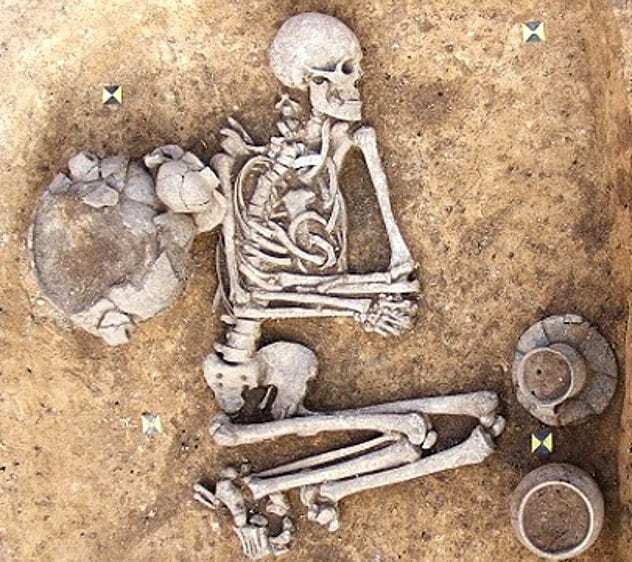 Since the skeleton was respectfully surrounded with grave goods, researchers believe the unique funeral was not a form of punishment.